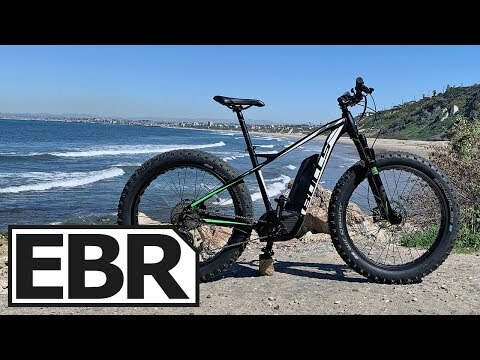 https://electricbikereview.com/bulls/monster-e-s/ The 2019 BULLS MONSTER E S is a fat tire electric trail bike with a RockShock Bluto suspension fork, remote lockout, 11-speed Shimano Deore XT drivetrain with Shadow Plus clutch, robust skid plate and alloy drivetrain guides. High-torque Bosch Performance Line CX motor with eMTB drive mode, sand and snow capable if you lower the PSI on the Schwalbe Jumbo Jim tires, premium Magura MT5 hydraulic disc brakes with adjustable-reach levers. Relatively lightweight and well balanced, available in two frame sizes for improved fit, high-capacity 500 watt hour battery pack with 4-amp quick charger can be filled on or off the frame, ABUS battery core can be keyed-alike to locks. No integrated lights or Monkey Link setup, non-locking flat grips, no bottle cage or fender bosses, Bosch Purion display is more basic and not removable, CX motor is louder and more power hungry.